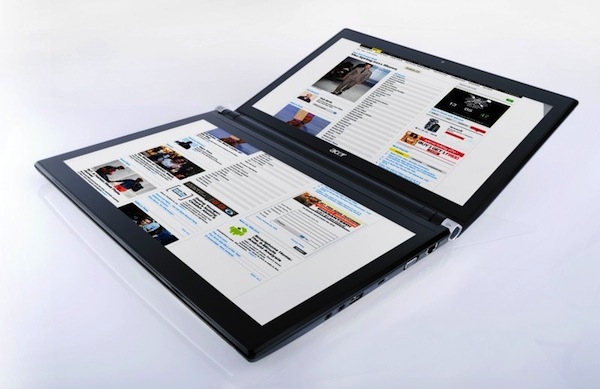 "Here in New York at Acer's Global press event, the company's talking touch. Lots and lots of touch. It'll be introducing a veritable smorgasbord of equipment as the minutes roll on, but it's kicking things off with its Windows 7-based Iconia dual-screen laptop / tablet, a device we've seen before." In the battle to remain relevant to perhaps more technically astute computer buyers (and perhaps to entice said buyers away from tablets), we have another laptop with two screens and a virtual multi-touch keyboard. Specifications are impressive, with Windows 64-bit Premium, Intel Core i5 processor, up to 4GB DDR3 RAM, two 14-inch LED-backlit multitouch LCD displays at 1366x768 protected by Gorilla®Glass, integrated Intel HD graphics, 320GB or larger hard drive, integrated 3G WWAN, one USB 3.0 port, and a 4-cell battery. Total weight is 6.18 pounds. This dual-screen concept is very interesting, and if the software can keep up with the hardware, this concept may prove to be very attractive. No details were provided on price or availability.